Difference between revisions of "Diorama"
"Unfortunately, I did not take photographs of the building that housed the exhibit, probably because I thought just how sad and pathetic the entire memorial display looked. 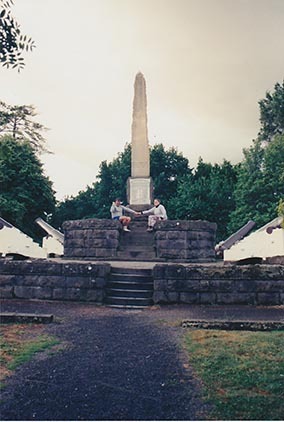 It comprised a reconstructed slab hut and nearby a partly-rebuilt fence that represented the hastily-built Eureka Stockade. 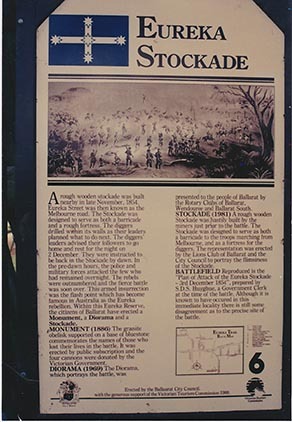 The signage that detailed the events surrounding the Eureka Stockade was affixed to the hut wall beside the entrance to the interior diorama. In the first photograph, you can see the dark, bare timber colour of the slab wood that held the signage plus (on the left side) one of the numerous holes in the slab walls. This made the display very cold and draughty in its interior. Once inside, you were confronted with an earthen, gravel and leafy floor, which became muddy, after rain, as it was on the day of our visit. 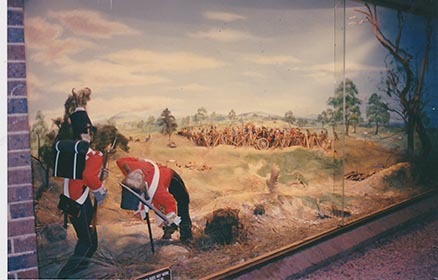 The diorama was held in a glass and cement display case. with no lights on. It was dark inside the hut so the diorama was not easy to see unless you inserted a coin into a metal pay-box. Then lights would turn on and a recording of shouting and gunfire (representing the battle noise) would play. I remember the whole experience to be short and underwhelming. 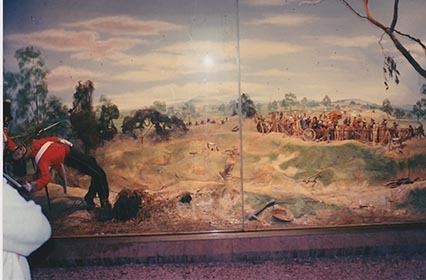 To get an idea of the scale of the diorama, you can see Brenda’s elbow & part torso to the left of the photograph labeled “diorama- hut exit”. 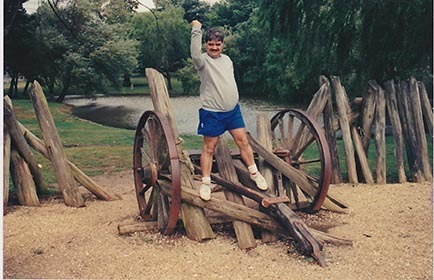 Once outside the diorama’s slab hut, you could walk across to a partial representation of the stockade’s fortifications, complete with two wagon wheels. This space was also gravelled to distinguish it from the rest of the green-lawn park.